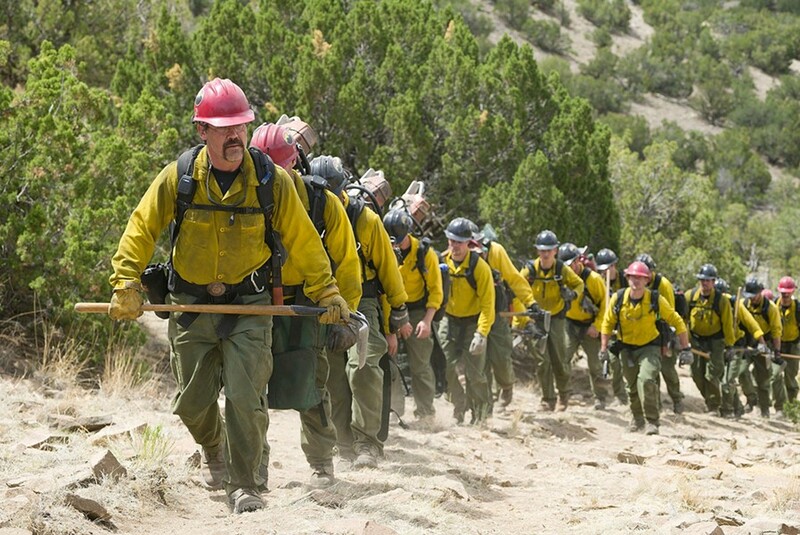 After a slow start, Only the Brave rallies to become a solid tribute to the Granite Mountain Hotshots, who lost 19 of their men battling the massive Yarnell Hill Fire in 2013. The Hotshots were an elite Prescott, Arizona, crew led by veteran firefighter Eric Marsh, played here by Josh Brolin. Brolin's performance ranks among his best, showing us a passionate man presiding over his crew like a father to his sons. Marsh takes a risk on Brendan McDonough (Miles Teller), a former drug user seeking redemption and a decent living to help provide for his newborn daughter. The always reliable Teller matches Brolin's acting triumph every step of the way, making both Marsh and McDonough fully fleshed, complicated characters. The two seem right at home with each other on screen. Director Joseph Kosinski (Oblivion, TRON: Legacy) takes a solid step beyond his prior sci-fi blunders to provide a movie that is technically sound, emotionally powerful and just a little hokey and over-long in spots. The movie is never bad, but it does drone a bit during some of the melodramatic build up. It never goes wrong when the team is on the job, fighting fires. It just gets a little sleepy when folks are sitting around talking or bickering. There are numerous fires we see the team containing throughout the film, giving the sense that these guys were in full command of their trade. Of course, nature is a sometimes awesome and awful beast, and when that wind shifts and sends the Yarnell blaze towards the unsuspecting men, you get a true sense of how random and crazy the event was. These guys were the best of the best, and even they couldn't predict what was going to happen. Kosinski has assembled a cast that includes Brolin's True Grit cast-mate Jeff Bridges as Duane Steinbrink, Marsh's supervisor. You can't go wrong with Bridges, who delivers good humor, at one point busts out his guitar, and ultimately provides the movie with solid emotional punch during the finale. Taylor Kitsch gets some good laughs as troublemaker Christopher MacKenzie, who gripes about handing over his new Vans to trainee Brendan, but winds up becoming his best friend over time. As Amanda Marsh, Eric's wife who takes care of injured horses when he's away, Jennifer Connelly gets a mighty chance to shine. Like Eric, Amanda has a rough past, and problems bubble to the surface during some of his quick stop-ins between fires. Connelly does well with material that would seem a little played out in the hands of others. She adds a little angst to the mix with Amanda, and it works. Knowing nothing about the art of firefighting, I can't vouch for the authenticity of this film, but it sure does feel authentic. The Hotshots do controlled burns to protect landscapes, save historical trees, and rescue neighborhoods. Additional supporting cast, like James Badge Dale as Eric's second in command, give you a sense that the actors did a lot of ride-alongs for their roles. Even though the movie that precedes it is a little long winded, and the fate of the men in the film is well known, the depiction of the Yarnell Fire still blindsides you. Brolin's Marsh figures it's just an easily-contained fire, and he'll be home for dinner. Kosinski portrays the shock of the whole situation effectively: the men were working what seemed to be a situation entirely under control. The final sequences in the movie are so well done, you'll feel kind of bad for groaning during the film's more lumbering parts. By the time Kosinski shows the real-life firefighters alongside their Hollywood counterparts, the film has become a nice homage to these great, unselfish men. Parts of the country are going through some of the worst fire seasons in their modern history. It's not surprising that this film didn't have a big opening weekend; it's a subject very close to home and truly painful for many. It's a movie that will gain an audience over time.